We have some interesting insights from two strategies that focused purely on Price Momentum in the last year or so. With 25%+ returns, here’s a look at how that happened, how it compares and what we’ve learnt. • Thirty stocks, all based on price momentum. • Love the all time highs, don’t bother with lows, focus on graphs trending up and right. • Trade once a month unless a stock shows major signs of deterioration (in which case you exit, but wait till the next month to add new positions) Target the first monday of the month for the rebalance. • If there are no opportunities it’s okay to be partly in cash. • Look for liquidity – prefer stocks that trade 3+ cr. per day on average. • The hedge: We would use Nifty options to protect against the downside in the short term. This was more “systematic” in the sense that the changes would only be done once a month. One “lot” of Momentum was about Rs. 200,000 in size, though we started with Rs. 180,000 or so. To buy more, you have to buy in multiples of this amount. But why only once a month, you wonder. Why not look at more shorter term strategies? To get a flavour of that, we created a “trial” strategy, called Mad momentum. Only the best of entries, for stocks that are showing major spurts in momentum. We relaxed the criteria for entry here; we would trade in and out, and we would reduce the liquidity requirements. Because this was a shorter term strategy. Note: Stock changes will happen on #actionable in Slack today (6 August) around 12 noon) as the August reshuffle. The Numbers: Momentum returns were about 29% in about 14 months. Here’s a bunch of stats around how Momentum has performed. We have had between 22 and 30 stocks – and sometimes even 31 (some stocks had demergers and we had the extra stock because of that). We have had 120 trades. That’s because every month we don’t switch out all the companies – only the ones that have lost momentum. The win-loss ratio is about 57% only. That means we lose 4 trades out of 10. The average winner is 21%, while we lose only 9% when we lose, on average. This builds up to an expectancy of 8.42% per trade. This isn’t too bad, and a positive expectancy over the longer term is the only way you can make money. The entry was because of a breakout to a new high, around 132. And we held through a painful 25% correction in November, and the stock went to 480 before it corrected back to 376, which was looking too difficult to hold, so we exited. The 183% return took 5 months. 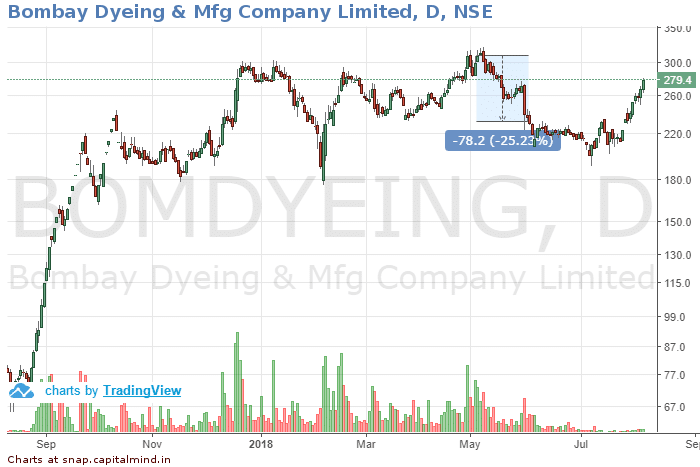 The worst was a 25% loss in Bombay Dyeing. This was a false breakout and the stock refused to do anything. We waited until the next month – it has lost all that momentum. With 25 current open positions, we retain around 30K or so of cash. 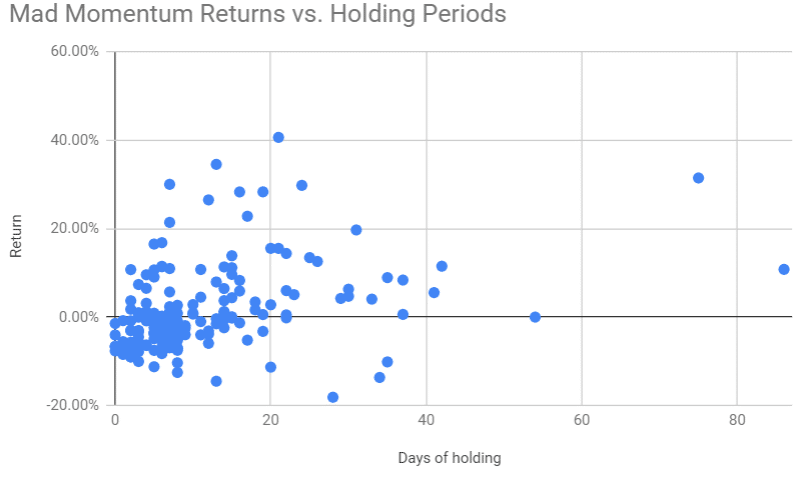 Mad Momentum on the other hand trades a lot more and has seen similar returns. Here’s some interesting parts of what we’ve learned in the last few years. Lesson 1: Strategically, Momentum is good. We earlier had another version of momentum. It was just 10 stocks, changing whenever we wanted (more “ad hoc” like Mad momentum). That was on between 2013 and 2016 November and made a reasonable 30%+ per year. (Read the closing post). And this one, Momentum’s third avatar, has done nearly 30% in 14 months. In fact, forget the hedges (which added about 3%). Let’s take only the stocks. Here’s how it has done compared to the Nifty and the Nifty Next 50, from the same inception date. It does of course have a higher risk. 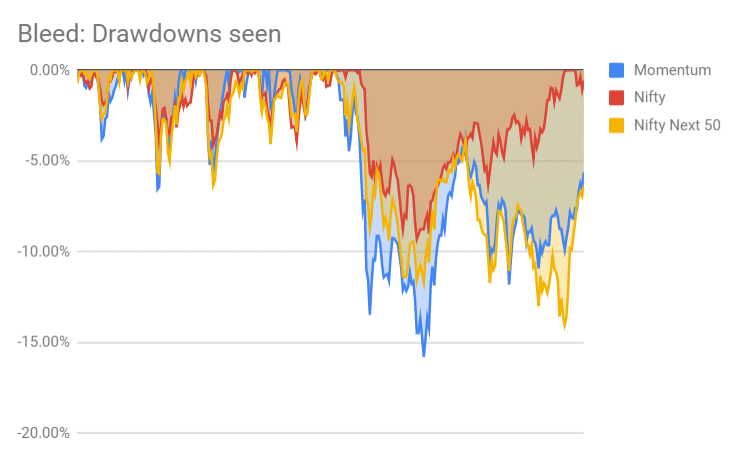 The drawdowns in Momentum are nearly double that of the Nifty. But for that risk there’s a commensurate reward as well. But this: You don’t even have to win more than 50% of the time, if you win more when you win, and lose less when you lose. Either ways, the fear of chasing momentum being, in some way, a negative thing, is unfounded. In the last four years we have actually demonstrated this using real portfolios and the main thing to track is the metrics. Mad Momentum provided us a better return but at the cost of too much action. With 180 trades, a lot will get eaten up with STT and transaction costs. But the expectancy in Mad Momentum is just 1.5% versus a whopping 8% in momentum. 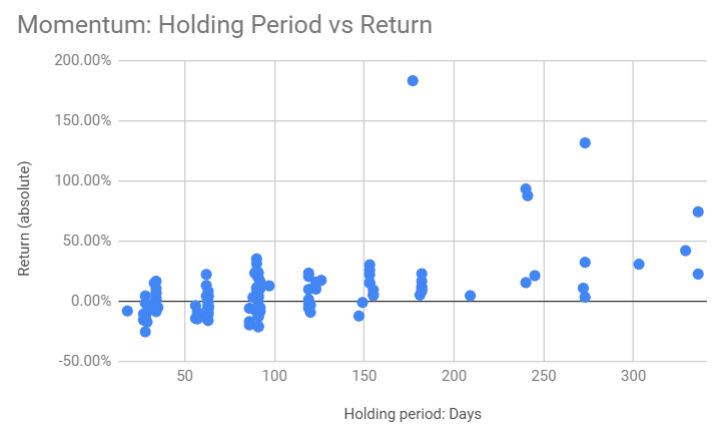 The lesser trading and longer holding periods seem to work better. We haven’t taken out transaction costs. Assume a lower return by say 1% to 2% due to transaction costs, even if for people in discount brokerages there’s not much of a cost to doing this. Mad momentum also shows you how to limit losses. We didn’t let anything go to 20% below, but in the process sacrificed some larger returns because of ad-hoc exits that were too early. In fact HEG was a part of this portfolio at 600 levels! If we had retained it, that would be a 7x return on that stock! Some part of mad momentum lost out because it was experimental. If it discovered a good stock that we put into the “momentum” portfolio. Lesson 4: Diversification is good. Even a few big losers won’t hurt you. We actually made 87% in Vakrangee. 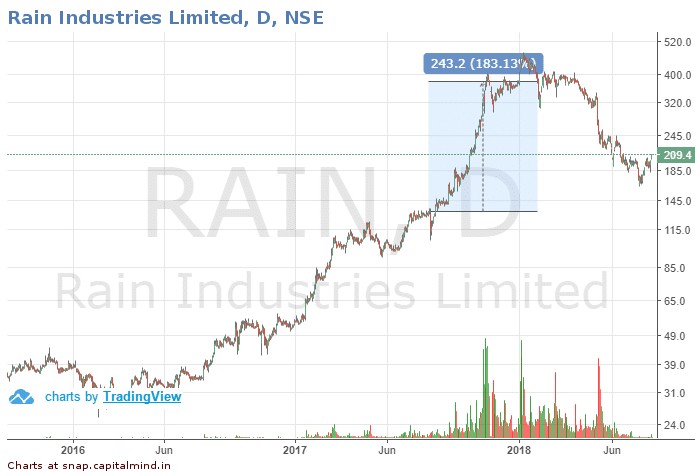 We bought at 202 in June 2017 and exited on 31 Jan 2018 at 376. But the exit was because the stock was cratering and it was a sudden exit (not the usual monthly). Assume you missed it. That you weren’t able to exit until the stock got out completely from the lower circuits, at 176, you would still have made a 25% return on your portfolio (instead of 29%). Diversification helps because it doesn’t create emotional baggage even if one stock falls. Emotional tension makes one take the wrong decision, and remember that most of investing in about your mind and behaviour rather than pure rationality. There is no way you can concentrate. If you asked us whether we knew that Rain would be our biggest winner when we started, we would laugh – there is no way to know. We had five option trades to hedge the portfolio which resulted in a profit of around 3% on the portfolio. While they can help, you don’t have to do much. Even without the hedges, the strategy has done well. 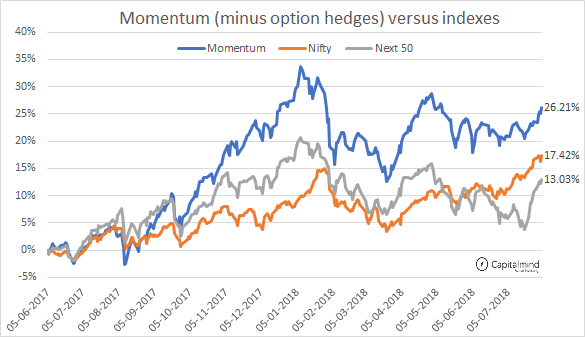 However in a market that’s trending down the hedge can be a lifesaver because Momentum is otherwise a long-only strategy. Lesson 6: Avoid the demergers. We entered Orient Paper and soon saw it demerge with a 1:1 share allocation to a new company, Orient Electric. For months, there was no way to exit the Orient Electric position because the new shares weren’t listed. We got out of Orient Paper and waited. The wait makes your performance hurt during the intermediate time because you have no way to mark the position to market. What’s the price of Orient Electric? Before it lists, you can only take guesses. Bonuses and splits too can get complex. Because the bonus shares (or the split ones) may take you some time before they are credited to your account. The way to avoid that is to sell the shares on the day before ex-date and buy them back immediately after that date. This adds a transaction cost but avoids the “shares in limbo” issue. By the way, when it did list, we exited it immediately, having gotten out of the smaller Orient Paper position earlier. We managed to eke out a little profit in the position. 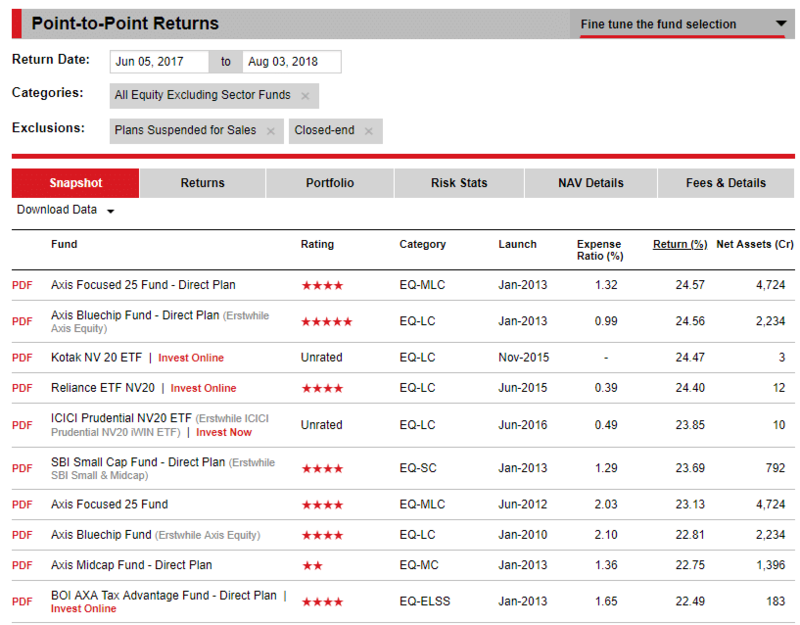 The top mutual fund in this time – Axis Focused 25 – has seen a return of 24.5% in this period. The momentum portfolio did 29% (26% if you excluded the hedges). Also note that our return calculation does not include any dividends. That would essentially have outperformed a little bit more too. You should of course include the impact of taxation. Momentum has 15% taxes (since we exit in the short term). With a return of 29% and perhaps another 0.5% in dividends – we might be seeing net returns of 25% post tax, which is still higher than any of the mutual funds. Risk wise, the max drawdown in momentum has been 15% with the Nifty and some other funds doing about 10%-12%. The way I see this is – is 15% acceptable? Our feeling is that Momentum has the ability to even do -25% at some point, so we should be ready for that. In that context a 15% drawdown is not too bad. This is only a one year performance of this portfolio and we’ll see more going ahead. But it provides us some useful lessons that we can take forward. Investing’s all about learning and improving, forever. There’s no one who can know everything in advance, so the idea of a strategy is to know what to do when the bad stuff happens. Oh and if one had to choose between the two, Momentum seems to have a better risk-reward than Mad Momentum. The “mad” part of the name tells you what it really is – an investment that’s more for the thrill of the game. If anything, it’s like a point to get into stocks that will eventually make it to Momentum. Let it stay experimental for now: the once-a-month Momentum strategy is far more efficient time-wise and risk wise. So, ride the winners, keep the losers in control and ignore the noise. If price momentum outperforms, then sometimes you have to just trust it and stick with it. We cannot emphasize this enough: This is a risky portfolio; and in these times, we will see such a long-only momentum portfolio hurt on sudden down moves. Take positions accordingly.